It’s been a long, tricky last few years for me. Somewhere in the fall of 2005, I started getting really passionate about social media. I went to a conference in April that convinced me that I was on to something. I attended BarCamp Boston in June, and that gave Christopher Penn and I the idea for PodCamp. In September 2006, I left behind a typical day job and joined a full time adventure. I started by working with Jeff Pulver, where we took on both a conference and an Internet startup at the same time. And as of last winter, I joined Stephen Saber and CrossTech Media in a similar-but-different set of endeavors. All the while, I’ve been maintaining a blog, a newsletter, speaking outside of where I work, attending conferences outside of what might be 100% germane to my business, and doing all kinds of other projects and experiences outside of those where I draw a salary. I’ve been doing this for just about three years at this point. My wife and children, as you might imagine, have to give up time with me for some of this. I work long hours. I travel quite a bit. I do a lot of creative things that run very late into the night. 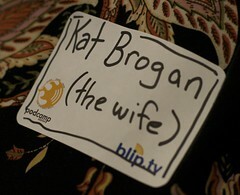 This past weekend, my wife Katrina attended PodCamp Boston 3 with me. It was the first time she had been able to come to an event with me. (That came courtesy of my parents, who watched our children for a little over 30 hours to help us make this happen.) She came to some sessions, sat with me in that beautiful glass lobby, and ate dinner with me Saturday night with a few new friends. It was great seeing Katrina talking with friends of mine like Jane Quigley, and watching her practice what she calls her Canadian sense of humor (awkward humor is Canadian?). It was so wonderful to see Katrina in the audience. I hadn’t had that experience yet – ever – in all of this that I’ve done. It made a world of difference. I’m a selfish guy. I don’t mean to be, but it’s something that I recognize in myself. As such, I sometimes take for granted just how lucky I am to have the love and support of my wife and children while doing all kinds of crazy things in pursuit of this vision I have. There are sacrifices and lots of faith that go with all that she’s done for me, and I’d like to pause and recognize this. I’m proud of everything Katrina does on her own and with the family. My kids get the best love and affection, and every day, I come home to a new adventure that she’s cooked up for them. I’m proud of what she’s accomplished, and excited to imagine what comes next. Further, maybe you who are also pursuing your own versions of these dreams might take an extra moment to thank your support team, too.